Remenber, last Thursday, a Qantas flight was forced to return to Singapore's Changi Airport shortly after takeoff, because the engine's covering, or cowling, tore off above the western Indonesian island of Batam. 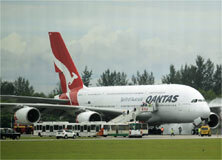 The Australia-bound flight was carrying 440 passengers and 26 crew members. From CNN, an updated Article, said : Qantas' fleet of Airbus A380 aircraft will remain grounded for at least 72 more hours, the Australian airline's CEO said Monday afternoon. The planes will not return to service until the airline is "100 percent sure" about their safety, CEO Alan Joyce said at a news conference. Oil leaks have been discovered in engines on three planes, and investigations continue, Joyce added. The leaks were beyond normal tolerances, he said. The engines have been removed from the planes and are being examined by Rolls-Royce, which manufactured them, Joyce added.